I mixed this recipe with another one I use. 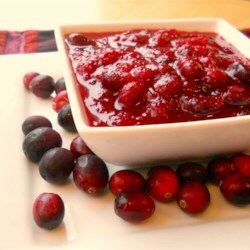 I boiled the cranberries and sugar in 1/2 cup OJ and 1/2 cup unsweetened pineapple juice until they popped. Then I added 6 oz. of fresh raspberries and mashed the whole thing. Finally, I added 1/4 cup grand marinier, a 14 oz. can of crushed pineapple (drained), and some crushed peacans. I cooked the mixture on medium heat until thickened, and refrigerated overnight. Yum!